Ingredients when reconstituted: potato, tomato, onion, leek, wheat starch, wheat flour, carrot, salt, maltodextrin (from wheat), sugar, sunflower oil, yeast extract, flavours, spices, garlic extract, colours [apocarotenal, beta carotene (contain fish derivative), caramel IV], flavour enhancer (635), spice extracts, herb extracts. Allergens:Contains wheat and fish products.Manufactured on equipment that also processes products containing soybean, milk, peanut, egg, sesame and crustacea. RICH BEEF & MUSHROOM CASSEROLE Serves 4 500g cubed topside, bladebone or other beef 1 tablespoon oil 1 packet Savoury Hot Pot 2 cups sliced mushrooms 1 1/2 cups (375mL) water STOVE TOP Preparation: 15 mins Cooking: 30-90 mins Brown meat in hot oil, in batches if necessary. Add Hot Pot, mushrooms and water. Bring to the boil, cover and simmer gently until meat is tender. Allow 20-30 minutes for tender cuts such as topside or round steak; 1 - 1 1/4 hours for less tender cuts such as chuck steak. For other cooking methods like oven or slow cooker see pack instructions. This is the best ever but why can I not find it on the shelves at coles & woolworths? 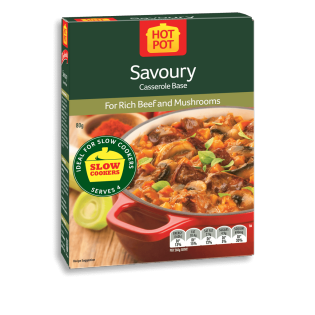 Hi, our Hot Pot Savoury Recipe Base is still available in Coles & Woolworths. Perhaps you could check with your local store manager.